Breakthrough Listen, which was created last year with $100 million in funding over 10 years from the Breakthrough Prize Foundation and its founder, internet investor Yuri Milner, won’t be the first to search for intelligent life around this star. While Siemion and his colleagues are skeptical that the star’s unique behavior is a sign of an advanced civilization, they can’t not take a look. They’ve teamed up with UC Berkeley visiting astronomer Jason Wright and Tabetha Boyajian, the assistant professor of physics and astronomy at Louisiana State University for whom the star is named, to observe the star with state-of-the-art instruments the Breakthrough Listen team recently mounted on the 100-meter telescope. Wright is at the Center for Exoplanets and Habitable Worlds at Pennsylvania State University. The observations are scheduled for eight hours per night for three nights over the next two months, starting Wednesday evening, Oct. 26. 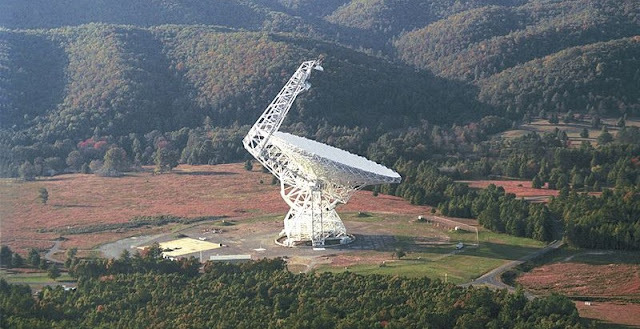 Siemion, Wright and Boyajian are traveling to the Green Bank Observatory in rural West Virginia to start the observations, and expect to gather around 1 petabyte of data over hundreds of millions of individual radio channels. The results of their observations will not be known for more than a month, because of the data analysis required to pick out patterns in the radio emissions. First reported in September 2015 by Boyajian, then a postdoc at Yale University, Tabby’s star – more properly called KIC 8462852 – had been flagged by citizen scientists because of its unusual pattern of dimming. These volunteers were looking at stars as part of the internet project Planet Hunters, which allows the public to search for planets around other stars in data taken by NASA’s Kepler spacecraft, which has been monitoring 150,000 stars for regular dimming that might indicate a planet had passed in front of it. But while most such dimming by transiting planets is brief, regular and blocks just 1 or 2 percent of the light of the star, Tabby’s star dims for days at a time, by as much as 22 percent, and at irregular intervals. While Boyajian speculated in her 2015 paper that the irregular dimming might be explained by a swarm of comets breaking up as it approached the star, subsequent observations show the star, which is located about 1,500 light-years from Earth in the constellation Cygnus, is far more irregular than a comet swarm would produce. In fact, it seems to have been dimming at a steady rate for the past century. Speculation eventually arose that the dimming was caused by a Dyson structure: a massive orbiting array of solar collectors that physicist Freeman Dyson once proposed would be a natural thing for a civilization to build as it needed more and more energy to power itself. Theoretically, such a structure could completely surround the star – what he termed a Dyson sphere – and capture nearly all the star’s energy. Breakthrough Listen is monitoring many other stars using three telescopes that can peer into all segments of the cosmos: the Parkes Telescope in Australia and the Green Bank Telescope to search for radio transmissions, and the Automated Planet Finder at Lick Observatory in California to search for optical laser transmissions.